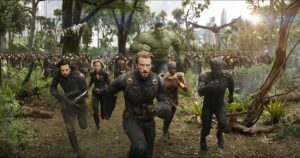 “Avengers: Infinity War” is one of the most anticipated movies of the year and has already become the highest grossing opening of all time, and for good reason. “Avengers: Infinity War” is the third installment of the Avengers, the 19th movie in the Marvel Cinematic Universe, and stars… well… pretty much everyone. Directed by brothers Anthony and Joe Russo, “Avengers: Infinity War” follows the Avengers, a group of seemingly undefeatable superheroes, as they team up with the Guardians of the Galaxy, a group of cosmic adventurers that’s number one goal is to protect universe, to defeat the strongest and most dangerous villain to ever enter the big screen: Thanos. Thanos is on a mission to bring so called order to the universe by collecting six power relics called the “Infinity stones,” which includes the Mind Stone, the Soul Stone, the Space Stone, the Power Stone, the Time Stone and the Reality Stone. It’s the Avengers’ and Guardians’ number one goal to prevent Thanos from collecting all six stones before he destroys all reality as we know. Another huge positive on this movie is the way the writers handled Thanos’s character. They actually made him feel like a legitimate threat, something most Marvel movies lack. They actually gave him a unique and interesting backstory, making him more of a 3D character instead of 1D like most villains in the MCU. There are some moments where you start to feel for Thanos, despite him trying to destroy half of humanity. Infinity War brought all the emotions of humor, anxiety, and tear-jerking moments into a perfect mix from beginning to end. However, the movie did lack overall character development for our heroes, which does make sense for the fact that we have had ten whole years to get to know these characters. It was more of a thrill ride than an actual storytelling experience, which I think we deserve after ten years of story building. It’s a lot of “shock-and-awe” with not a single dull or bland moment. Infinity War squeezes every drop they can out of their 150 minute runtime. If you’ve spent ten years watching Iron Man and Nick Fury work to assemble the Avengers and protect the universe, then get up and buy a ticket to this movie, but stop by your local Walgreens first and get some tissues, you’ll need it.